The team that brought you the biggest Paddy’s day party in the smallest Irish bar are back to throw another rowdy event to take over your June Long weekend. On Sunday 11 June, The Wild Rover will transform into a lively British beer garden (indoors, of course) complete with your favourite British food, drinks and music. 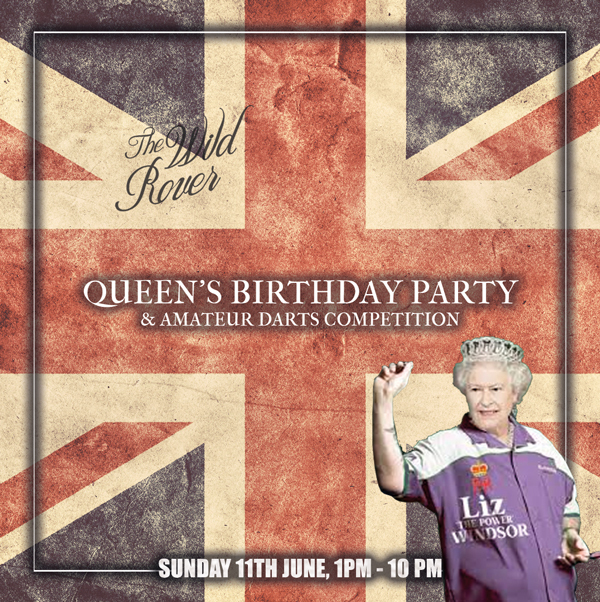 The Inaugural Wild Rover Amateur Dart Competition will attract some of the finest outfits and worst dart players from across Sydney. There’ll be prizes for best costumes handed out in the afternoon so come in your loudest, head-turning fancy dress of your choice. For dress up inspiration, click here to view some of the outfits from the World Dart Championship. Entry to the dart competition is $20 with the winner taking the pot plus a $100 bar tab. Drinks will be flowing, in typical Rover fashion, as we serve up $7 Guinness, Pimm’s Cups, $15 Earl Grey martinis and a selection of cocktails the queen would be proud of. The Rovers will be shucking oysters along with Surry Hills’ finest Cornish pasties, strawberries & cream and egg n cress triangle sandwiches to soak up the abundance of festive beverages you’ll likely throw back. If you’ve ever been to one of our parties, you know what you’re in for. Hold up your tankard or tea cup and toast to the public holiday Monday.… Cheers Lizzie! Your long weekend in Sydney is sorted.